In Shiver, Grace’s parents seemed to like Sam. From the beginning of Linger, it seems like they don’t like him anymore. Why do you think their opinion of him changes? 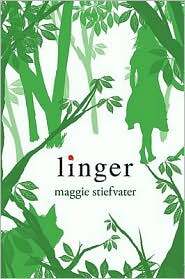 How is Grace’s relationship with her parents different in Linger than it was in Shiver? Do you think Grace’s parents have a right to place restrictions on her after they have been absent for so much of Grace’s teenage years? Do you think Grace was justified in breaking her parents’ rules by going to the studio with Sam? Why or why not? Grace’s mother keeps telling Grace that in five years she will have forgotten Sam’s name. Why would Grace’s mother say that, and how might she be trying to protect her daughter? If you were Grace’s friend, would you be worried about Grace’s state of mind or her close relationship with Sam? What would you do to help Grace? Cole is very intelligent, but he is also suicidal, unstable—and famous. Why do you think Beck chose him to become a werewolf and look after the pack? For Cole, becoming a werewolf was an escape from his past. Do you think this is an appropriate way to deal with your problems? What would be a better way for Cole to deal with his insecurities and drug addiction? How is Cole’s relationship with Isabel different from Sam’s relationship with Grace? Do you think they love each other? Isabel makes it a point to tell Cole, “I’m not a nice person.” Do you think Isabel is protecting herself by saying this? Do you think Isabel really isn’t a nice person? Why do you think Victor’s pituitary problem would affect his ability to stay a wolf? There is a lot of debate in Linger about whether the process of turning into a werewolf is science or magic. Do you think the explanation is all science, all magic, or a little bit of both? What difference would it make for people if they found out that becoming a werewolf is the result of science or magic? How might one answer be better than the other? Cole curses at Grace’s father at the hospital. Do you think he had a right to do that? Why do you think Sam decided not to turn back into a wolf in order to stay with Grace? Was he being selfish?